Papua New Guinea well and truly buried the memory of last week’s match in Port Moresby beating Tahitii 2-1 with a dominant performance in Papeete to claim three crucial points in the chase for a spot in the 2018 FIFA World Cup Russia™ – OFC Stage 3 final. Having already shown the strength of character to perform for almost an hour with one man less than their opponent – to earn just their seventh ever win during World Cup Qualifying – was all the sweeter for the side following that 3-1 loss at home. “We also did a good game in Port Moresby but there was a certain situation that occurred there…but it’s history now,” coach Flemming Serritselv said. Papua New Guinea signalled their intentions early with a blistering shot just tipped over the cross bar by keeper Mikael Roche, swiftly followed up with a powerful effort into the side-net from Nigel Dabinyaba. It took over ten minutes for Tahiti to first test their opponents goal with Sylvain Graglia, who scored twice in Port Moresby, making one of his zig-zagging run into the penalty area. Once Tahiti had made their way up that end of the field they did their best to stay peppering Ronald Warisan’s goal with shots from Graglia and Teaonui Tehau on target. Having shared the chances in the first half, it was fitting that the score was locked at 0-0 going into the break. Both sides made changes at half-time, Jonathan Tehau replacing his injured brother Lorenzo for Tahiti, while Patrick Aisa came in for Richard Alois. For the visitors it was an inspired decision to bring the sprightly midfielder Aisa in as he immediately got to work disrupting the Tahitian midfield. And it was Aisa who broke the deadlock in the 62nd minute when he got on the end of a corner delivery from Raymond Gunemba, heading it between two defenders and around the diving Roche. Ten minutes later and the Kapuls were back trawling in Tahiti’s half when Aisa once again proved a thorn in his opponent’s side. He chased down the ball, flicked it centre to Gunemba who curled it over the keeper to give Papua New Guinea a two goal lead. 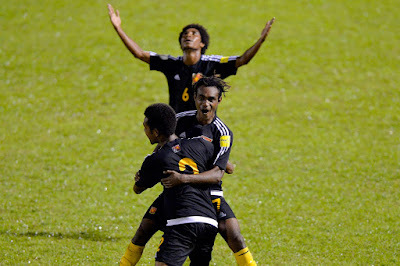 With the regulation 90 minutes up, and three minutes of additional time to play out it seemed like the night was up with Papua New Guinea set to secure the win with a clean sheet. However Tahiti had a super-sub of their own. in the third minute of stoppage time Tauhiti Keck caught the defence and keeper Warisan unaware, slipping the ball into the back of the net through a scramble of bodies in front of the goal mouth. Tahiti coach Ludovic Graugnard was disappointed his side couldn’t seal their place in the Stage 3 final against New Zealand with a win, but always knew it would be a hard ask. “What was missing today was winning in the middle of the field,” Graugnard said, we said even before this game that the battle in the middle of the field would be important. “That the Papua New Guineans would arrive here with a lot of determination because their hopes of continuing were riding on this encounter.